The LG V30 will soon be available in a new color option. Today, LG announced that it will officially introduce the new "Raspberry Rose" pink hue for its high-end model at CES 2018. In its press release, the Korean company describes hue as an "intense saturated version of red" that's "quite unlike any previous smartphone color offered by LG or its competitors". 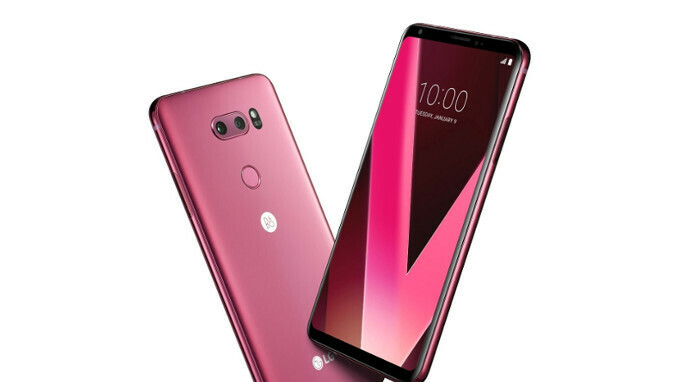 In reality, the new V30 color option does look quite hot in this new variation that we'd commonly call 'pink'. In case you're wondering, the LG V30 is also offered in four other shades - Aurora Black, Cloud Silver, Moroccan Blue, and Lavender Violet. The Raspberry Rose LG V30 will have its commercial premiere in South Korea shortly after CES. After that, it will become available in key markets in Europe and Asia. Sadly, it looks like the color won't be officially sold in North America. Make the phone properly available worldwide instead of worrying about new colours. Agree, but the color is ugly. I mean this is a classy looking phone, this color does not match it. So true... delay to unveil after announcement, delay to price it right after unveiling, delay to distribute it across the world after pricing it, delay to unveil unlocked version, All these delays caused this amazing device to be forgotten and buried under the competition. Fix the bluetooth issue before releasing the phone in another (ugly) color. How about marketing the phone in its original color(s)? Oh my this color is beautiful!